Original Surf Music by The Beach Boys Live from the Summer of 1962. 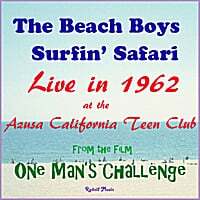 Live version from the 1962 Documentary "One Man's Challenge" recorded at the Azusa Teen Club on July 27, 1962 in Azusa, California. Brian, Dennis and Carl Wilson, Mike Love, and David Marks.